Read more about Net Tool Box on the features page. This release adds re-written Ping, Ping-Scan and Traceroute tools as well as a new time-saving, application-wide contextual menu and much more. Free update for registered users. Check out the release notes for a full listing of new features and fixes. 30th March 2005 - Net Tool Box 3.0 recieves a REALbasic Design Award! 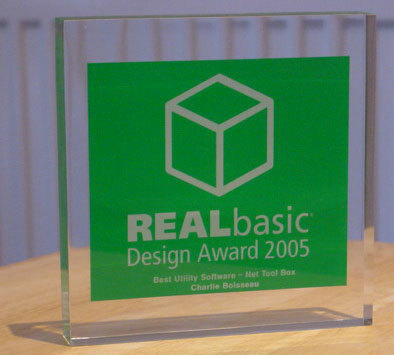 It is with pride I announce that REAL Software awarded Net Tool Box the title of 'Best Utility' in their REALbasic Design Awards. The awards were announced last week at the annual REAL World developer conference, held in Austin, Texas. The complete list of winners and runners-up can be found here. 28th January 2005 - Net Tool Box 3.0 now available! I am glad to say that the long-awaited update to Net Tool Box version 3 is now here! With dozens of new features, you wont know how you lived without it. 1st October 2004 - Net Tool Box receives 4/5! In the latest issue of Macworld (US), Net Tool Box was reviewed and awarded 4 out of 5 mice. Check out the 'Software Bargains' section in the November issue or read it online to see what was said. 1st January 2004 - Net Tool Box receives 5/5! MacUser (UK) has given Net Tool Box a 5 mice out of 5 rating in the Christmas special edition. "In every respect [Net Tool Box] manages to out-perform Network Utility. ", says Howard Oakley, the MacUser reviewer. Buy Net Tool Box now with your Credit Card or PayPal account.